Big Booty Baller Fulfills Dream by Going Rogue! Poo-Ping Chinese Restaurant Group Costume! I play in an adult competitive dodgeball league in West Hollywood where the names of the teams are usually some fun pun (like What Would Jesus Dodge or Game of Throws). This season my team decided to be a costumed mash-up of the English TV show Absolutely Fabulous and Marvel Comic characters calling ourselves Absolutely Marvelous! 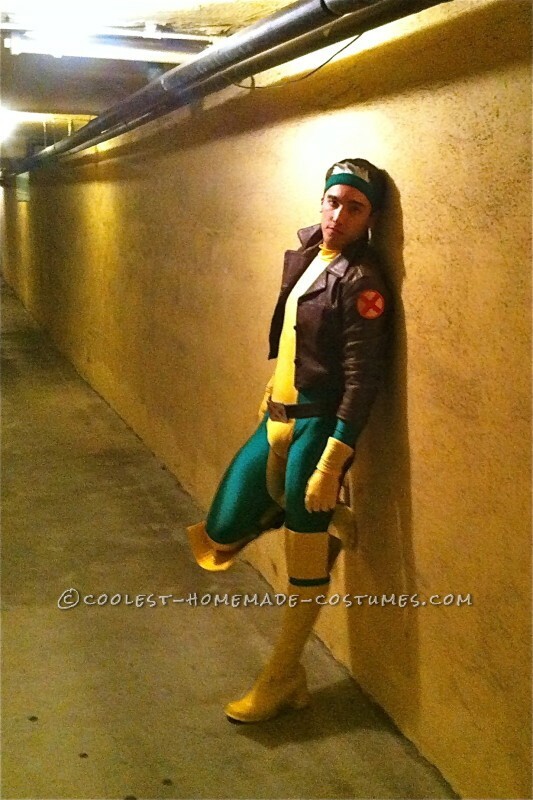 Ever since I was a young, Rogue from the X-Men was always my favorite hero. Even though I would have loved to dress as her every Halloween, as a closeted gay boy in my small Texas town, I never had the guts to do anything beyond buying her action figure (which took more guts than you might think). 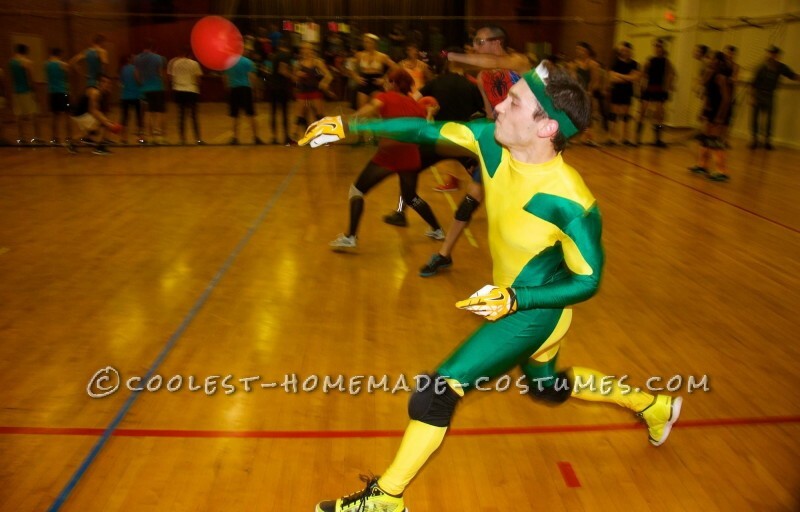 With the dodgeball season AND Halloween approaching, I saw my perfect opportunity to do something I’d always dreamed of. I’m a self-taught costume maker, but I’ve never attempted something quite as complicated as Rogue’s bodysuit. I started by making a unitard in all yellow. Wearing it, I tracing the lines down half of my body in yellow sharpie where I thought the green should go. After which I patterned the sharpie marks and copied that into the green fabric. I then cut out the yellow and replaced the appropriate parts with green. Not the most time efficient process, but it worked. I used the left over yellow spandex to make the gloves. I then scoured the local Good Wills for a women’s leather jacket and found a long one for $15 that I then cut to fit me and added an X patch I cut from an old backpack. A friend was throwing out a black pair of tattered gogo boots, so I added some craft foam paper to the top, covered it all in yellow duct tape, and added some green elastic bands. I even covered a rectangular belt buckle in red and silver duct tape to give it the X look. Finally, I ordered a brunette wig and a white wig from Amazon.com and cut and sewed them together. I can’t play dodgeball in heels, and the wig usually gets tossed to the side by half time, so I developed a Man-Rogue Version of the costume where I attached some left over hair from the white wig to my headband to give myself spiky white bangs. Regardless of the version I am in, I get positive reactions everywhere I go. It got over 100 likes on facebook in 2 days, and dodgeballers love that I show up to the games and then to the bar afterward in full costume. Two weeks ago I ended up grocery shopping as Man-Rogue and a little boy couldn’t have been more excited to see an X-Man shopping in the frozen food section. I’d always figured Rogue wore the bodysuit solely because it keeps every part of her body covered (lest anyone touch her skin and she inadvertently absorb their memories, life force, and powers). After donning the suit myself, I think this touch-starved heroine might have slightly more scandalous motives because have yet to wear the suit without having numerous guys AND girls grabbing this southern belle’s booty! It’s been a real confidence booster, and I can’t wait to find more excuses to wear this costume!